The Tesla Coil display is activated automatically every 15 minutes. NB, this exhibit is loud, and may cause discomfort for young children or visitors wearing hearing aids. Check how the electric arcs move around the cage. If you were locked inside the Tesla Coil and you could take safety equipment with you inside the cage, what would you take? What is the purplish glow? Why does the Tesla Coil create noise as it works? 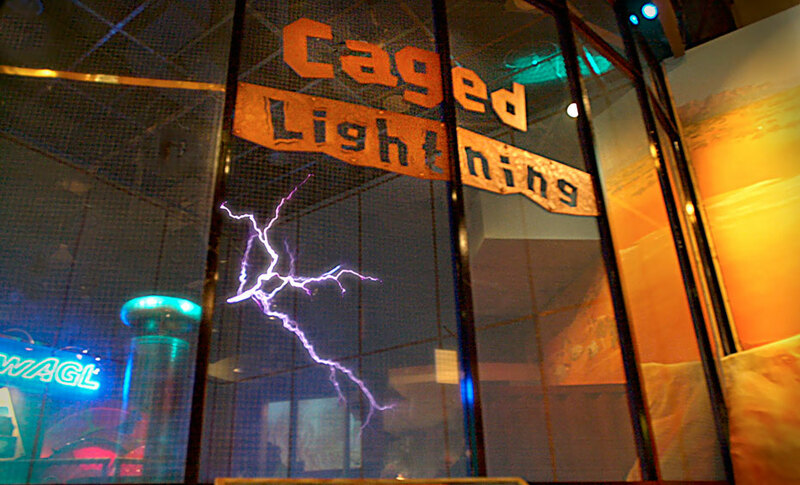 The lightning here in the cage is produced using a Tesla coil which works like the ignition coil of a motor car. At very high voltages, molecules of air break down to form plasma. 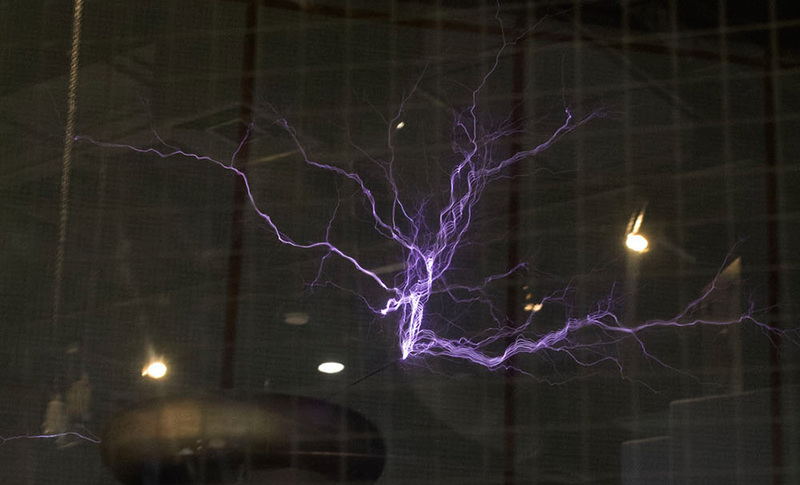 The Tesla coil builds mains electricity at 240 volts up to 3 500 000 volts; enough to cause plasma to form and allow the air to conduct electricity as lightning. When the lightning strikes, the air temperature rises rapidly. The air expands and causes the sound you hear.The cage provides an easy path for the electricity from the coil to earth, and protects you from the ‘lightning’. Lightning is caused by a flow of charge which occurs in less than half a second. Scientists think that the charges for lightning are built up when water and ice particles move around inside a cloud and the negative charges collect at the base of a cloud. An opposite positive charge builds up on the ground, particularly on high points such as treetops, flagpoles or buildings. A large discharge of electrical energy follows the path. The air becomes extremely hot, expands rapidly and explodes. This produces the light that we see as lightning. The rapid expansion of the air also starts a shockwave which we hear as thunder. If you are caught outdoors, stay away from anything tall or metallic. Crouch down in the open, and don’t worry about getting wet. If driving, stay in the car, but park away from trees and power lines. If swimming or boating, try to return to the shore.